Actually not yet. …but it seems that he is looking for it. 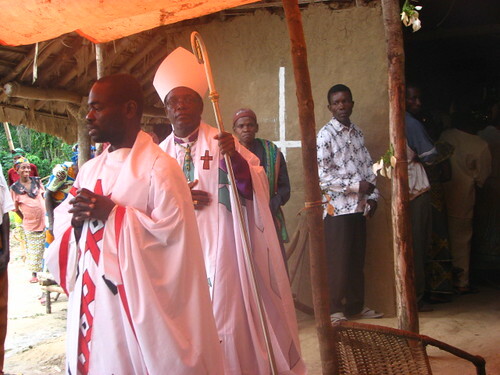 The bishop visited Obenge. Crispin passed his boat when he was heading downstream towards Opala. Crispin was returning the Civil Society representatives and picking up Major John who promised to clean out the last of Major Ranger’s gang, those who had been off in the forest on his last “clean-up” mission. The photo Crispin got of the Bishop’s boat is very reminiscent of the image from the 1951 movie, African Queen, with Humphrey Bogart and Katharine Hepburn. 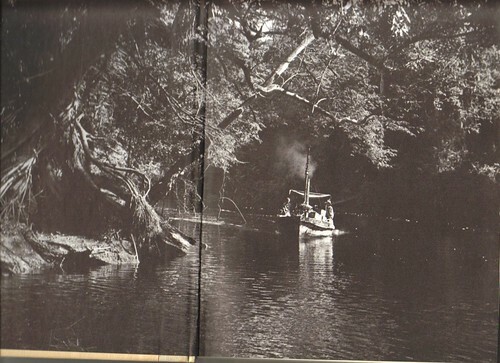 The African Queen was filmed on the Ruiki River which flows north between the Lomami and the Lualaba, dumping into the latter just south of Ubundu. 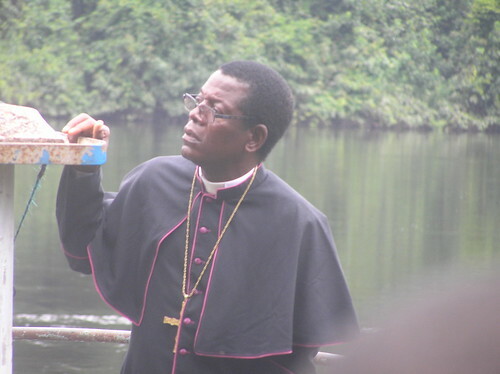 With a lot of fanfare, even if not Hollywood, the Bishop arrived in Obenge the evening of Tuesday, the 22 of April and very early in the morning of the 23rd took off with a guide and accompanying catechists into the forest. Mystery mission, of unlikely evangelical significance. Later that morning he called a town meeting where he made some comments not worth repeating about our Project TL2. 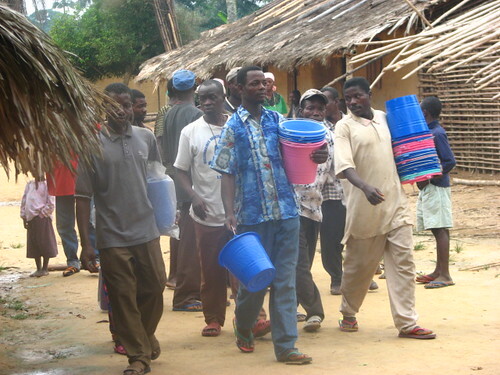 He passed out salt and plastic buckets to the assembled and he met with the town leaders to tell them he was interested in a forest concession near Obenge. The town elders were non committal. John was a half day’s hike into the forest at the Losekola Primate Camp and did not witness the visit. Crispin was back in Obgenge on Thursday. He gathered eye witness reports, but despite his efforts to meet him personally, the Bishop was always asleep or indisposed. Crispin did however manage to talk to some of the catechists and to explain to them what we were doing. He showed our official papers. 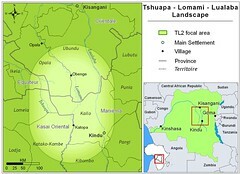 John (later): Seems remarkable that the Bishop would come all the way to the southern limit of his diocese for a forest concession when the Lomami cuts through a couple hundred km of virgin forest further north. Crispin : Let’s wait and see….it seems that he has other interests. He visited streams where it is said that the Belgian colonialists extracted diamonds and other unknown minerals. A pertinent aside: This same Bishop of Isangi made another visit to a far corner of his forest diocese in February of this year. This time to the village of Yeikombo – west of Opala – on the road to Ikela. He promised the village that he would build schools and hospitals. One night soon after his arrival he was caught by the PPRD (acting as local police) on a clandestine visit to a diamond mine from which a large “stone” had recently been extracted. Under interrogation, and in a very human fit of “passion”, the bishop said that with “this kind of reception” he would do nothing for the village. And of course he hasn’t. 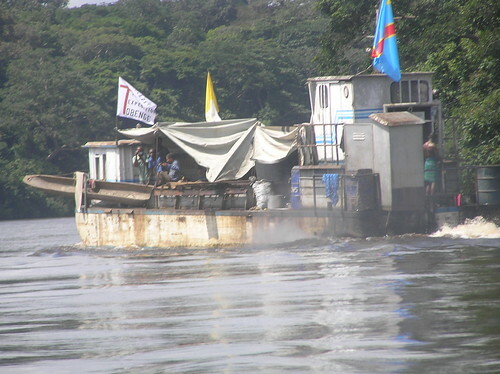 The last of Major Ranger’s poaching gang enter the Bishop’s boat. Back to Obenge: Major John did round up the last three of the elephant poaching gang. 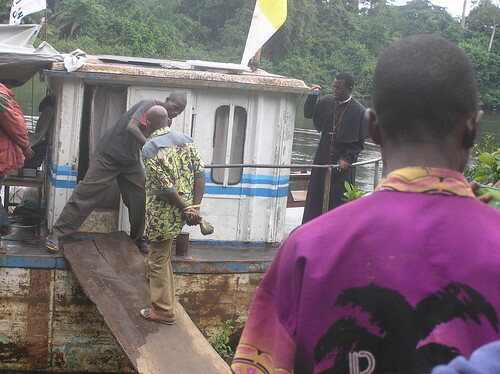 With little ceremony, and to the surprise of the bishop, they became “guests” on his boat back down the Lomami to Opala. Speechless, the bishop watches the operation. As Crispin said, “Let’s wait and see.” If there is a follow-up you will know. 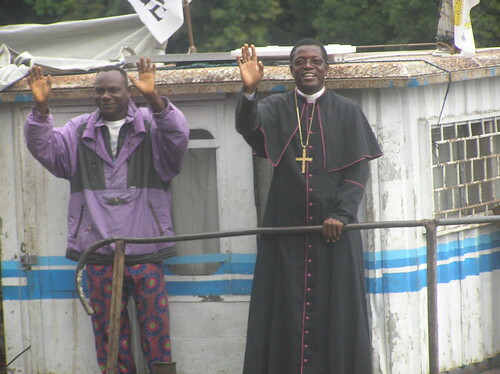 The Bishop of Isangi and a catechist wave farewell…”adieu” might be preferable. A note: I am a Catholic and an adult convert at that. I could not write this without also giving testimony of some of the incredible sacrifice that catholic clergy made for their congregations during the recent Congo war. On the other hand the Catholic church is one of the most human. It has its underside. This entry was written by Terese Hart, posted on 2008-04-30 at 5:33 pm, filed under Diamonds, gold and guns. Bookmark the permalink. Follow any comments here with the RSS feed for this post. Post a comment or leave a trackback: Trackback URL. Corruption comes in all sizes and shapes, it seems. Terese, the picture of the Bishop looking so, well, speechless is priceless. Being Catholic, I’m used to some hypocrisy with these men of the cloth, but this story really amazes me. You know, I was actually naieve enough to write to the Vatican a couple of months ago…reminding them to place greature emphasis on conservation. When will I learn. Well, the Pope did declare pollution a sin. Yes Sheryl, and I also remember him declaring climate change as the biggest threat, we face today. Yet he did not rescind the Church’s ban on contraception. He can’t fight one without the other. Hey,I think letters to the Vatican are very appropriate. If conservation truly became a higher priority of the church perhaps a lot of other elements would change more easily. As a Catholic with a converted husband and a member of a church that has had two clergy removed for inapprorpriate conduct–I agree with all the above–The chuch is a very human organization–it is also about time the Catholic church recognized the importance of stewardship in the world as well as in human populations–glad the Pope finally acknowledged conservation of energy, resources and nonpollution as priorities–I have my own problems with their authority in other matters, but it is the best we have and for all the low points, there are some quite extraordinary high ones…letters to the Vatican on their way. I signed, of course. Michael, you are a wealth of information I did not know about these 2 companies. I wonder how this will be dealt with at the Atelier de Zonage Forestier next week. Any ideas? Our Bishop of Isangi is acting as an individual not the church in his endeavors in Obenge. Michael, I signed this petition also. Thank you for providing us this opportunity to help. Terese, I’m sending some sunshine your way. You and the team are doing one heck of a job! I remember the picture of the team, trudging through the swamp…can’t send them a nice, hot shower but this should help. Take care. Theresa, MANY MANY thanks!! My delight is that I will be going to join the teams in the field next Tuesday to return to Kinshasa on the 23rd. It will be a pleasure to tell of your enthusiastic participation! Terrific, safe trip and God bless. To give the exposure that your post deserves to the Congolese public (and as a courtesy to the Monsignor lambasted in it), I took the liberty of translating it into into French and of posting it on a Congolese blog.